WE ARE HIRING!! We are looking for an assistant – can be Brisbane or Darwin based. Our practice assists individuals and businesses with Australian immigration matters, such as visa and citizenship applications. Essentially, we have Registered Migration Agents and Lawyers providing advice and assistance across a broad range of service areas, including student visas, family visas, employer sponsored visas, skilled migration and appeals. We are looking for a part-time assistant based in Brisbane or Darwin to provide administrative support to our Registered Migration Agents and Lawyers in our practice – starting with 3 days/week with potential for full-time employment. This role would suit someone with experience as a personal assistant, secretary/receptionist or someone with excellent skills in admin, finance administration, marketing and business development. Experience and/or interest in immigration law is highly desirable; although not necessary. 1. Corresponding with clients, prospects and stakeholders (by phone and email). 2. Email and calendar management (consultations, events, appointments). 3. Finance administration (using Xero). 4. File admin + management (using Leap Migration Manager): creating files, preparing document lists, preparing visa applications and forms, file notes, etc. 5. Marketing projects and event planning, including locating and scheduling business events. 1. Supervision and support – you will learn a lot about immigration law and how to run a successful migration practice! 2. Opportunity to work on interesting and diverse cases – never a dull moment in our office! 3. Exciting career opportunities – we are a growing business with lots of potential for the right people! If this sounds like you, please send us an email to request the selection criteria for the application! We are looking to fill the role asap and happy to make a quick decision, if we get the right candidate, so APPLY NOW! 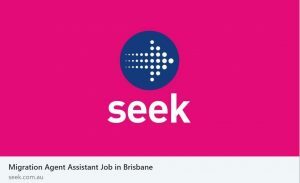 See full job ad on Seek here. Please help us finding the right person for this role!! Share with your contacts and pass it on to people who you think might be interested in this exciting job! !